1. Trump met with and embraced Kim Jong Un, a brutal dictator. Obama never met with Ayatollah Ali Khamenei, never joked around with him, never got friendly with him. 2. During his meeting in Singapore with Kim, Trump committed to cancelling joint military exercises with South Korea in two months. Obama did not cancel any joint military exercises at all, including with Iran’s arch enemy Saudi Arabia. 3. Trump praised Kim Jong Un, saying, “Well, he is very talented. Anybody who takes over a situation like he did at 26 years of age and is able to run it, and run it tough. I don’t say it was nice.” He also allowed as how the North Korean people are very enthusiastic about his rule. Obama never called Ayatollah Ali Khamenei “talented” or praised him for “running Iran” “tough” or said that he is much beloved of the Iranian people. 4. 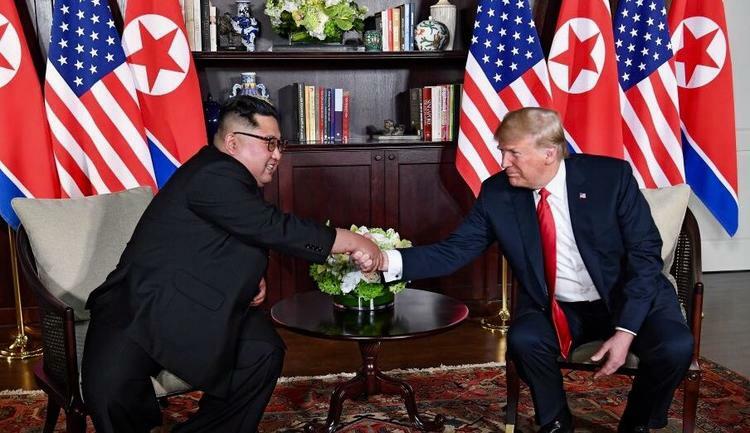 In the joint communique contains the language, “Reaffirming the April 27, 2018 Panmunjom Declaration, the DPRK commits to work towards complete denuclearization of the Korean Peninsula.” The statement contained no specifics at all, and analysts warn that Pyongyang interprets “denuclearization” as removing the US nuclear umbrella from South Korea and Japan. In the Iran deal, Iran committed to actual specific steps guaranteeing that Iran would not develop nuclear weapons. The Iran deal or Joint Comprehensive Plan of Action concluded in 2015 required no follow-up meetings because it was actually a, like, deal (at least until Trump violated the treaty). 6. North Korea can use its centrifuges to produce six new nuclear bombs each year (it already has 60). Nothing in the communique commits it to cease doing so. Iran never had a nuclear bomb and had never made a commitment to developing one, though before 2003 its scientists did some experiments relevant to constructing one. In the nuclear deal with the UN Security Council plus Germany, largely negotiated by the Obama administration, Iran pledged to reduce the number of its centrifuges from 20,000 to only 5,000 older machines, too few to create a bomb in less than a year even if Iran went for broke. 7. North Korea has not made a specific commitment to reduce its stockpile of enriched uranium, with which it can freely construct bombs. 8. North Korea’s bomb-making centrifuge facilities have never been inspected by the UN’s International Atomic Energy Agency and nothing in the joint Singapore communique requires any such inspections.